Australian Shepherd Characteristics: The Amicable and Nimble Australian Shepherd is a breed of medium sized dog, classified as a member of the Herding Dog Group (AKC:1991). The Australian Shepherd, is characterized by its muscular, alert appearance with a flat, well proportioned head, alert expression, and a smooth, agile gait. Other characteristics include a long, straight back, deep, chest, slanting, almond shaped eyes and medium sized, triangular shaped, pendulous ears that are slightly rounded at the tips. The temperament of the Australian Shepherd can be described as Loving, Active, Protective. The coat type of the Australian Shepherd is described as thick, medium coat in assorted colors. Due to its characteristics and qualities, the Australian Shepherd demonstrated the desired traits of a Watch dog and Farm Dog and is known by its nick name the "Basque Shepherd Dog". The ancestors of the Australian Shepherd dog breed were originally from Australia but the breed was developed, and saved from extinction, in USA during the 1800's. Australian Shepherd Breed Group and Dog Type - Herding Dog Group (AKC:1991): The Australian Shepherd is one of the many breeds of dogs that belong to the Herding Dog Group (AKC:1991). 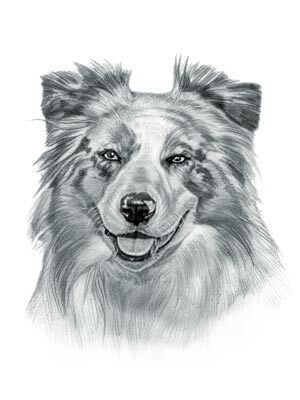 Other names for the Australian Shepherd: The Australian Shepherd is known by the nickname of the "Basque Shepherd Dog". Other names for this breed of dog include the Aussie, Little Blue Dog, Aussie and Australischer Schaferhund. Origin of the name "Australian Shepherd": The origin of the name "Australian Shepherd" is a subject of some debate, due to the breeds strong association with America. The most plausible explanation is that the ancestors of the Australian Shepherd, the Basque Shepherd Dog, were introduced to the United States via Australia during the 1800's and Americans developed the breed but retained the name "Australian Shepherd" honorably reflecting the origin of the dog. The Australian Shepherd and the Basque Shepherd dog: In 1770 English explorer James Cook claimed Australia for the British Crown and the colonization of Australia began. In the late 1700's. Wool was big business and as the prices of wool soared the Australian colonists realized they could make massive profits from rearing sheep - the best sheep of the time were Merino sheep. Merino sheep were developed in Spain and were highly prized for their fine wool. Until the 17th century Spain had the exclusive right on breeding Merino sheep. In 1804 some ewes and rams from the Royal Merino Flocks of Spain were exchanged with King George 111 of England for some valuable horses. These Merino sheep were purchased by John Macarthur, considered the father of the Australian Merino industry, and introduced into Australia. Australian farmers used selective breeding to produce the authentic Australian Merino sheep, with an even finer wool. Basque Shepherd dogs, the most experienced Merino sheepdogs from the Basque Country in northern Spain, were exported to Australia to tend the valuable flocks and herd the sheep. These dogs became known as the Australian Shepherd. The dogs were not developed as a distinct breed, were cross bred with other dogs and were at the point of extinction until they were exported to America. Australian Shepherd History in the United States: In the mid 1800's sheep were imported directly from Australia to the West Coast of America and with the sheep came the Australian Shepherd. The Australian Shepherd became the preferred breed for herding sheep because of their stamina, trainability and intuitiveness to handle sheep in the tough, difficult conditions of working large flocks across vast areas in the American west. By the late 1940's there were over 50 million sheep grazing across the open ranges throughout the western half of the United States and Basque herders from Spain were recruited to address the labor shortage in the sheep industry. The Basque herders brought their Basque Shepherd dogs with them and these became mixed with the Australian Shepherd dog. The Australian Shepherd began to be developed by dog breeders who were able to sell the dog across the whole of the country. The Australian Shepherd Club of America (ASCA) was established in 1957. Australian Shepherd Modern History: The sheep industry fell into decline by the 1970's but the Australian Shepherd attracted considerable interest from the public as they began to appear in Disney movies, on TV shows and in rodeos. The Australian Shepherd was officially recognized by the American Kennel Club (AKC) in 1991 and the dog was accepted into the Herding Group.. The modern history of the Australian Shepherd moved on and the breed is now used as a guide dogs, watch dogs and highly successful search and rescue dogs. The Australian Shepherd is one of the most popular dogs in the United States as an obedient family pet and companion and many are still kept as farm workers. Australian Shepherd Height: The Australian Shepherd breed is classified as a medium sized dog. The height to the shoulder of a male dog is 20-23 inches (52-58cm). The height to the shoulder of a female dog is 18-21 inches (46-53 cm). Australian Shepherd Weight: The weight of the male in the medium sized Australian Shepherd dog is 50-65 pounds (25-29 kg). The weight of the smaller female dog is 40-55 pounds (18-25 kg). Australian Shepherd Coat Type: The coat type of the Australian Shepherd is described as thick, medium coat. Australian Shepherd Coat Colors: The colors of this dog breed consist of assorted colors consisting of red, blue merle, red merle, red, black and tri-color (white, black, and tan). N.B. Merle describes the mottled patches of color in a solid or piebald coat. N.B. The word "Blue" is used to describe a cool-toned, metallic gray color. The term "Red" refers to reddish shades of orange, brown, and tan colors. Australian Shepherd Grooming - LOW Grooming Needs: The dog grooming needs of the Australian Shepherd Dog are categorized as Low in order to maintain a healthy coat and reduce the risk of skin infections. The limited dog grooming needs of the Australian Shepherd Dog are therefore considered to be low maintenance, requiring limited attention to grooming with casual brushing and combing. Dog Grooming needs should also include bathing the dog on a monthly basis and making regular inspections of the eyes, ears, nails and teeth. Australian Shepherd Litter Size: The litter size of the Australian Shepherd dog breed ranges from 6-9 puppies. Australian Shepherd puppies for sale can be obtained reputable breeders and from rescue centers. The cost of Australian Shepherd puppies varies depending on location, pedigree history and the dog breeder. Australian Shepherd Temperament and personality: The temperament and personality of this popular dog breed is described as Amicable, Loving, Active, Protective and Nimble. Australian Shepherd Exercise Requirements - MODERATE Exercise Requirements: The exercise requirements of this breed of dog are moderate. The Australian Shepherd requires regular daily exercise consisting of approximately 30 minutes every day. This powerful dog has a vigorous gait with strides of a moderate length requiring firm handling and a brisk walking or jogging speed by the owner to meet the dogs exercise requirements. Australian Shepherd Diet: A fully grown Australian Shepherd should be fed twice a day. A diet consisting of a premium dog food can be balanced with fresh food eaten by the family. The question is What Can Dogs Eat?. Check out our comprehensive list of what dogs can and what dogs cannot eat. Australian Shepherd Health Problems: Potential health problems of the Australian Shepherd breed include Hip dysplasia . Resolving health problems can prove to be expensive and it is always wise to obtain pet insurance or dog health insurance when buying a dog. Is the Australian Shepherd dog breed said to be Hypoallergenic? Answer: No. Australian Shepherd Lifespan: The life expectancy of dogs vary according to the size, breed of dog and any serious health problems. The typical lifespan of the Australian Shepherd breed is 12-15 years. Australian Shepherd Male Dog Names: Male Dog names for the Australian Shepherd are most often chosen to reflect favorite names of the owner or the strength, size, coloring and country of origin of the Australian Shepherd breed. To give you some inspiration regarding good male Australian Shepherd names our small selection might be of help with naming boy dogs. Our top male dog names are: Gideon *** Joash *** Rufus *** Jake *** Rusty *** Casey *** Winston *** Tucker *** Gizmo *** Samson. Australian Shepherd Female Dog Names: Female Dog names tend to be softer, prettier and reflect the temperament of the Australian Shepherd girl dog. Our top choice of good female Australian Shepherd names are Vesta *** Juno *** Zia *** Molly *** Maggie *** Bella *** Cupid *** Penny *** Kishi *** Lael.